When I was contemplating ideas for today’s Tentacle Tuesday, this idea came to me (undoubtedly influenced by the steampunk novel I’m reading) to draw the original Holmes and Watson. 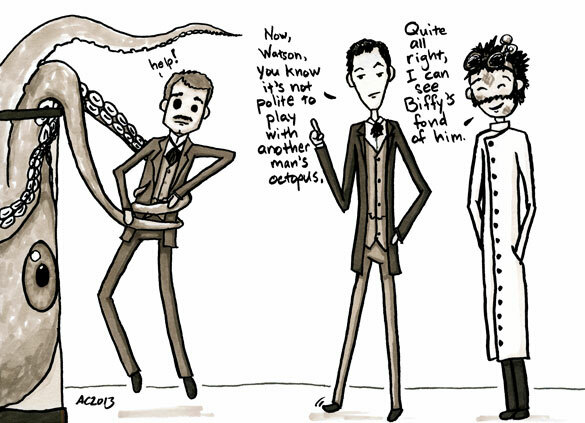 I borrowed the fashions from one of the old Paget illustrations, so blame him for Holmes’ weird little jabot, and then added in our random steampunky science nerd and of course Biffy, the friendly octopus. He just really likes Watson’s moustache, I feel. It’s quite dashing. I decided to shade it all in warm greys to give it the feel of an old Victorian daguerreotype or something, which always runs into the question of whether I should color the skin of the people or leave them white as the paper. 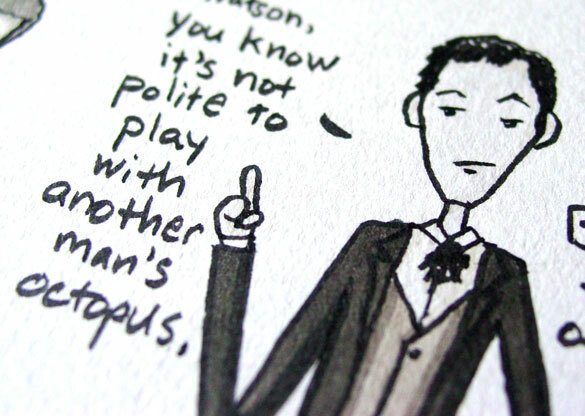 I compromised by making Holmes very pale indeed, and giving Watson and the scientist a bit more robust warmth. 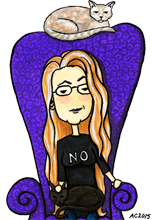 This kind of coloring takes a bit less time than proper color, as the limited palette simplifies things. Another Man’s Octopus, 7″x5″ pen & ink and Copic marker on paper. Above, you can see the line that made me decide I absolutely had to draw the comic, along with an unimpressed Holmes uttering it. 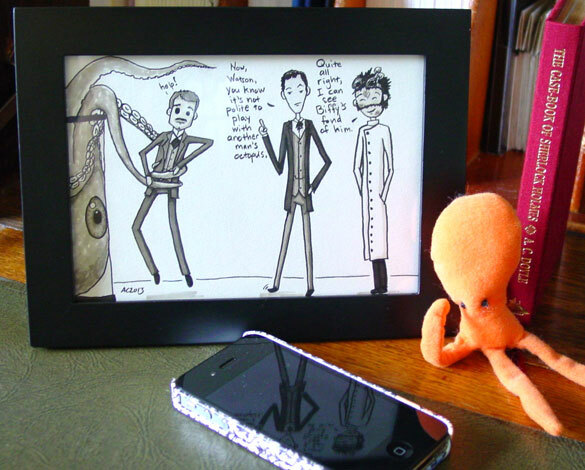 Below, they’ve made it into a frame with my bored 5-armed plushie and one of the original books.